We have moved the AccurateShooter.com Daily Bulletin to a dedicated server, and have expanded the format with a new look. Hopefully, posts should be easier to read, and the search tools on the right should be more obvious. Also, now you can easily navigate to the most popular sections of AccurateShooter.com (such as our Forum) via the handy tabs at the top of the page. Share the post "New Look, New Location for Daily Bulletin — Change Bookmarks"
The NCAA Rifle Championships are being broadcast LIVE right now on the NCAA.com Broadband channel for college sports. There will also be live broadcasts on March 14th and 15th. 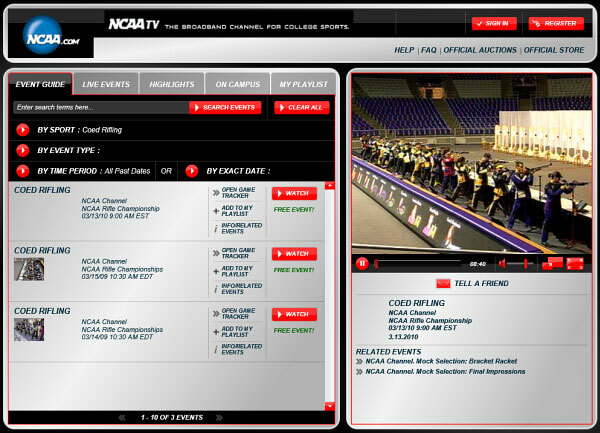 To access the future broadcasts, go to the NCAA TV website, click the “Event Guide” tab and search for “Coed Rifling”. Note: To view streaming video you may need to install the Microsoft “Silverlight” plug-in for your web browser. CLICK HERE for Live NCAA Rifle Championships Coverage. Share the post "LIVE NCAA Coed Rifle Shooting Championship WebCast"
The first 2010 CDNN Investments catalog has just been released for downloading. 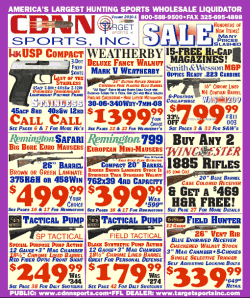 As usual, it contains impressive deals on handguns, rifles, shotguns, scopes, magazines, gun parts, and shooting accessories. Plus, as part of CDNN’s “March Madness” sale, CDNN is offering low-cost $5.99 shipping for any internet order. You can also get Free Shipping for internet orders over $200 (use Coupon Code fs200). NOTE: These special shipping offers apply to this weekend only — the offers expire Monday, March 15th at 12:00 noon CST. Among the discounted handguns are the popular KelTec sub-compacts, HK USPs and P30s, and a wide selection of Springfield Armory 1911s. CDNN also has stainless demo models of the sleek Sig Sauer p232 — complete with night sights. Very nice gun that will hold its value. There are scores of AR15 type rifles at deep discounts, plus CD Defense AR15 bare lower receivers for just $99.99. Hunters should check out the inventory of Winchester Model 70s. There’s a nice Belgian-proofed Featherlite with Safari sights, premium Schnabel fore-end stock, and cut checkering. Chambered in either 300 WSM or 7mm WSM, this would make a handsome elk rifle for just $699.99. Share the post "NEW 2010 CDNN Catalog Released — Some Notable Bargains"